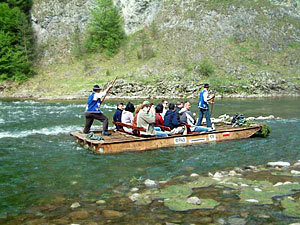 If you have come to Cracow for a holiday of a week or two you may also wish to visit places outside Cracow. Tourists who come for short breaks to Cracow see only the city and miss the most wonderful aspects of this part of southern Poland - namely the stunning countryside. The big town that most people visit after Cracow is Zakopane, nestling below the Tatra Mountains. During the winter, Zakopane is a ski resort with a multitude of ski slopes in and around the town. It is geared up for tourists and has good facilities apart from restaurants and shops. The zakopane Aquapark is good for family swimming. It also has a ten pin bowling alley and its own parking. Just north of Zakopane in Szaflary is a set of four geo-thermal swimming pools maintained at a constant temperature of 36 degrees. These are lovely for a relaxing time. Two of the pools are outdoor and people rub themselves with snow before jumping into the pool. Near Zakopane is the largest swimming pool complex in Poland, still relatively new it was completed in 2010. It has lots of flumes and fun things for children to do. The area around Lake Czorsztyn also has lots of activities for all ages, There is an alpine coaster that gives people a ride down the mountain side, there is the enormous lake with boats and canoeing, castles to visit and good walking. Ski slopes operate during the winter. In the Pieninski National park, east of Zakopane, flows the River Dunajec where rafts steered by Highlanders in traditional national costumes take tourists through the beautiful ravines to Szczawnica, a town with cycle hire and a flat car free path beside the Dunajec River for safe family cycling. In between Cracow and Zakopane is the spa town of Rabka Zdroj where visitors come to take the waters, enjoy massage and special treatments, go walking in the hills surrounding the town for stunning views, or hire bicycles for a cycling break. This is a just a small glimpse of what the countryside south of Cracow has on offer. There are four national parks in this area, plus a national park just west of Cracow, and that is an indication of the beauty of the countryside alone. 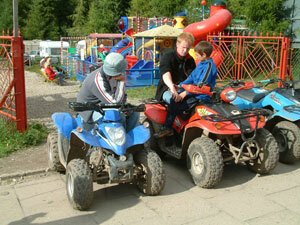 are lots of outdoor pursuits that tourists can engage in from horse riding to quad biking and aerial adventures.